KBS undergraduate summer researcher Francisca Donkor is a sophomore at Harris-Stowe State University. She wrote about her Research Experiences for Undergraduates project working with mentor and LTER researcher Heather Kittredge, a PhD student in Sarah Evans’ lab at MSU. 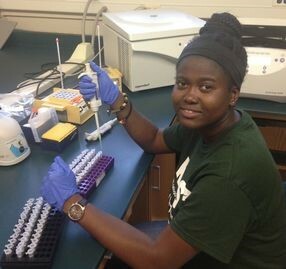 Francisca was funded by an NSF REU site award to the Kellogg Biological Station. Coming from Harris-Stowe State University, which is comparatively small in size, I knew I had a lot of adjusting and learning to do from day one of my Research Experiences for Undergraduates project at the Kellogg Biological Station. That kept me on my toes all the time, as I moved from one activity to another. On that fateful May 21st when I left Missouri, I kept thinking to myself that the demands and relationships I experienced this summer would be very different than any experience I had previously had. I spent the entire flight going over (again) articles my mentor sent me before the program, doing my best to make sense of the complicated scientific jargon. Upon arrival, I met with Heather Kittredge, my close mentor throughout the eleven weeks and she briefed me on the summer schedule. I could not stop thinking about how hard I was going to have to work to obtain quality results during the short eleven-week program. Francisca extracting DNA back in the lab. The focus of my research was to understand how management practices affect the abundance of extracellular DNA (eDNA) in the soil. To begin the research, we collected soil samples from fertilized and unfertilized plots at a deciduous forest at the KBS Long Term Ecological Research (LTER) project. In previous studies, it has been shown that nitrogen fertilization can reduce microbial biomass, but it was unknown how the abundance of eDNA changed in different soil treatments and how quickly eDNA degraded in the soil environment. We hypothesized that disturbances such as the application of nitrogen fertilizer caused cell death, leading to an increase in the abundance of eDNA in soil. To quantify the abundance of eDNA we treated the soil samples with the chemical propidium monoazide (PMA) which binds to DNA after exposure to light, but cannot penetrate the cell membrane. We extracted the DNA and quantified the amount of 16S rRNA genes in the samples using quantitative PCR (qPCR). We spent much of the summer confirming our methods were accurate, which means I got to experience some of the truest trials and tribulations of the scientific process. Ensuring PMA was exposed to enough light to activate it was a problem, to solve this problem, we had to make a light activation chamber that was really a cupboard in a closet. I was most amazed by the day to day process of using creativity and problem solving to retrofit our old methods into new methods that enhanced our ability to quantify eDNA. For example, one methods problem was ensuring PMA was exposed to enough light to activate it, but that the rest of the procedure was done in the dark. To solve this problem, we had to make a light activation chamber that was really a cupboard in a closet. 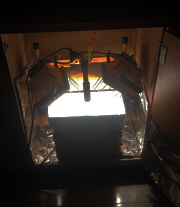 We learned that the best set-up was a 1000-Watt halogen light in a cupboard lined with tinfoil, shining into a bucket of ice that held samples in petri dishes, gently swirling on a shaker table (depicted to the right). At the end of the summer after lots of method development, we got the satisfaction of gathering quality data! At the conclusion of our research, we concluded that eDNA was significantly lower in fertilized vs. not fertilized plots and that eDNA degraded quickly after only about ten days. KBS gave me an opportunity to be the audience to people who have excelled in their respective scientific concentrations and I was able to provide a couple of tricks and ideas that helped them in their journey. At the end of the summer I was proud to present the research results, explaining the procedures to colleagues and other mentors. The culmination of my journey was an elevator speech to the entire KBS community during the final days of the program. Through these activities this summer, I have built up my confidence and I am prepared to take on senior year and whatever career awaits me in the future.